Last week, members of Northfield Transition Youth/YES (Youth Energy Summit) who worked on welding downtown’s new combination recycling/trash bins stopped by my corner office at GBM for a photo. 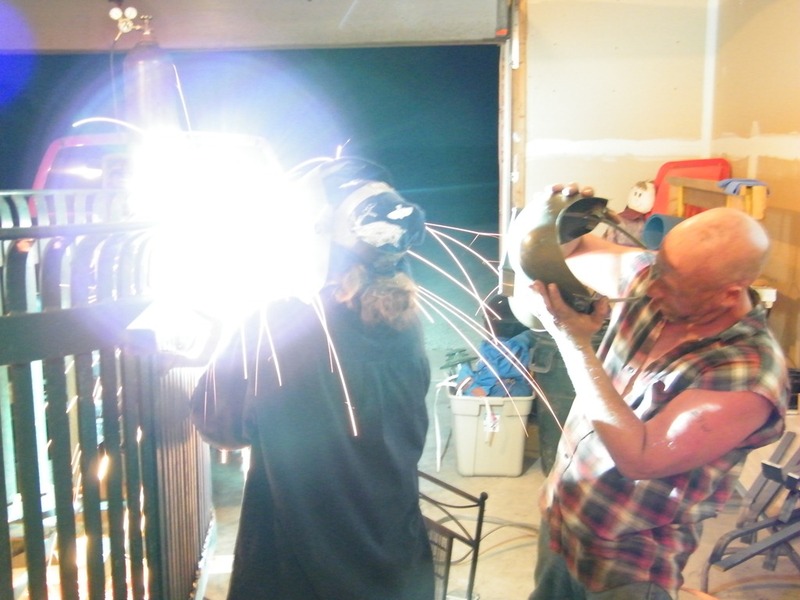 And they brought a few photos of themselves welding the bins with Eco Gardens co-owner Howie Holt. 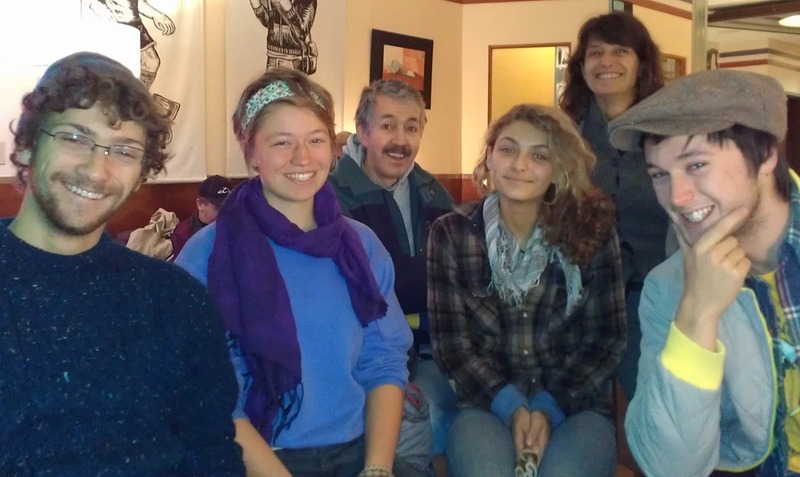 In the photo on the left (L to R) are high schoolers Arlo Cristofaro-Hark, Helen Forsythe, Antonia Cristofaro-Hark, and Cliff Martin. Not pictured: Avery Swearer. Behind them are two of the many adults who were involved in the project: George Kinney and Mary Jo Cristofaro. Northfield Transition Youth/YES developed the project to build recycling bins for downtown because, as Griff has complained, the plastic wheelie bins chained to the trash receptacles weren’t very attractive (and then they disappeared) and to encourage recycling. I believe they had a design competition, but their first design made of wood did not pass muster with the HPC. George Kinney was helping develop the project in its design/initial attempt, but I believe this was as a private citizen and not an EQC project. The Downtown Streetscape Task Force was moving ahead to buy receptacles much like what has been created, but they cost $1500 apiece. Streetscape was willing, but that’s when Howie stepped in to say — Hey, we can do this cheaper here. 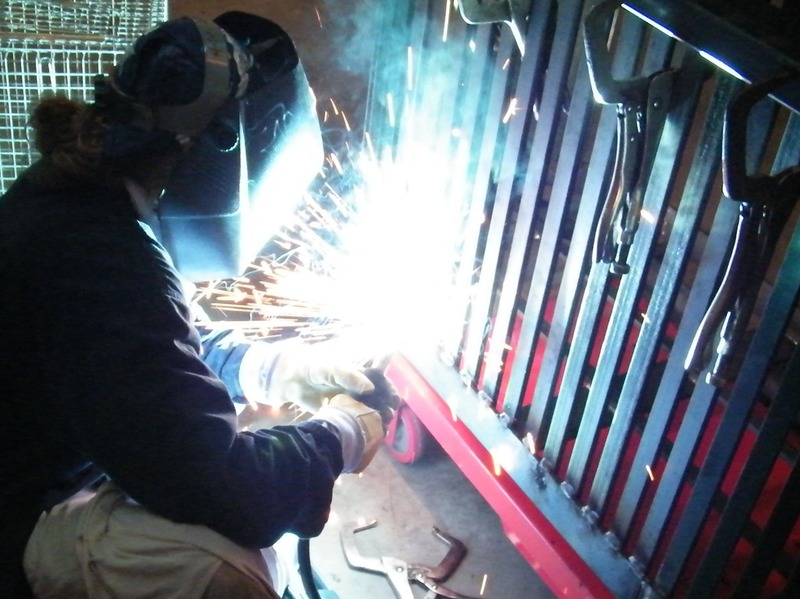 I can teach kids to weld, we can cut apart old trash containers and “stretch” them with similar-looking slats. A bit more back and forth on this — keeping recycling dry is a big deal because wet paper, according to Joe Stapf, spoils the lot, so ensuring there were lids on the containers was critical. 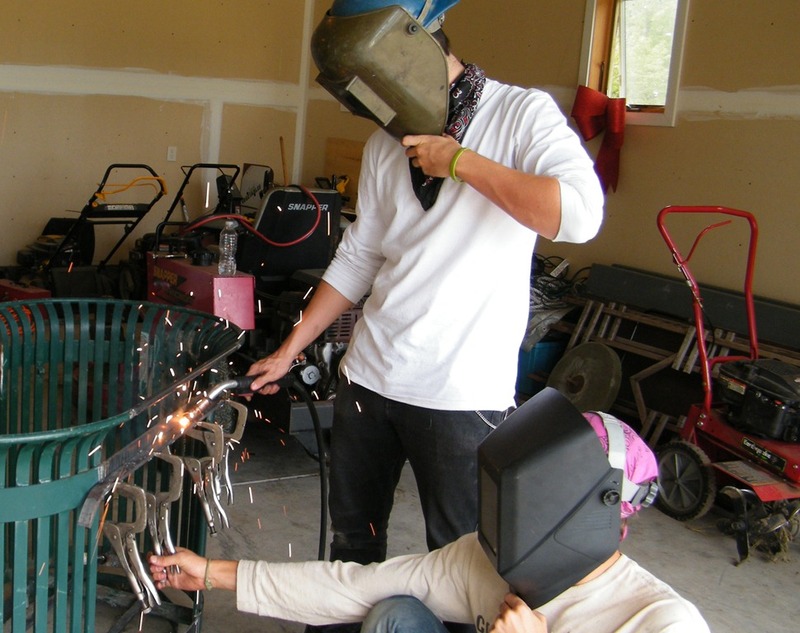 TJ Heinricy helped by providing old trash receptacles for creating a prototype. Streetscape Task Force worked out the details and is paying for the containers. And, now they’re beginning to appear on the street. 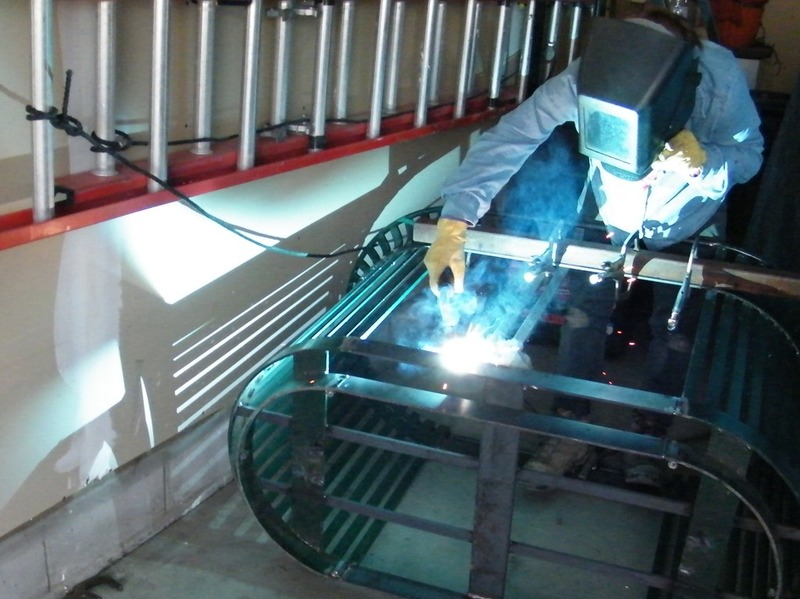 I understand from Howie that he’s got some great youth welding talent, too. The Transition youth, Mary Jo Cristafaro (another adult assistant), and Howie deserve a round of applause for their idea, persistence, and execution. Looks great; saves money. Betsey, in addition to the much-deserving Joe Stapf and T. J. Heinricy, I think thanks, by name, are due to Bob Will, Chair of the Streetscape Task Force, Steve Edwins, Member of the Heritage Preservation Commission, and Betsey Buckheit, Second Ward Councilor, for walking down to Eco Gardens and checking out Howie’s prototype. They all went the extra mile (okay, maybe it was only half a mile) to give the local option a chance. Although having a decision-making rubric is a great idea (it can promote fairness and efficiency), it would appear that sometimes it’s a good idea to add a little “common sense” or, for a lack of a better term, subjective valuation to the decision-making process. The decision had been made according to the proper policy/procedure and the process/organization was moving toward timely implementation when Howie basically asked, “Could you give it another minute or so?” and Joe, T. J., Bob, Steve, and Betsey said, “We can give it another minute or so”. Understandably, it would be a challenge to municipal efficiency (in terms of time and, sometimes, money), if we essentially second-guessed every decision made by a public sector group or entity. However, in this particular example of a sometimes stumbling (or seemingly inefficient), and admittedly stop and go process, reviewing the decision, particularly double-checking both the explicit and implicit values likely to be used by the community to judge the results, before taking irreversible steps to implement the plan, resulted in a better outcome. Well deserved credit goes to the stalwarts of Transition Youth/YES, Mary Jo, and Mera Colling, who worked on quite a few designs over the past year and a half or more — lots of prototypes, many false starts, and I think we are so happy that the final design received everyone’s approval. TJ and Howie really came through for the group — helping to find solutions and getting the process moving. It wouldn’t have happened without their help. The group received additional support and encouragement from Northfield in Bloom and Curt Saffle of Waste Management. As far as the EQC is concerned, we’ve been pushing for permanent downtown recycling options for probably close to 10 years, with Suzie Nakasian being the champion for several years on EQC (and then Planning Commission). Happy to have had a hand in it. Thanks to the leadership of a group of Northfield High School and Arcadia Charter School students, along with the help of the community, city workers are now in the process of installing what will eventually be 28 new recycling/garbage bin combos in the downtown area and parks where no recycling bins were previously available.